This is a set of 2 replacement under dash bulbs for a 1970-1981 Trans Am. 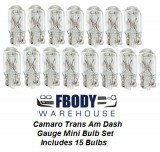 This is a replacement glove box light bulb for 1970-1981 Trans Am. This is a factory used GM warning light gauge for 70-81 Firebirds. We have 2 styles available, please use drop down box below to choose the correct style needed. We have a unit with the bird emblem and two with the secondary ring available. This is a factory used GM bright light indicator tunnel for 1970 - 1981 Firebird. This tunnel mounts inside the gauge cluster and when the head lights are clicked to brights this is the light tunnel which the light passes through to be seen on the gauge cluster face. We also offer the BLUE lens as well so see our other products. 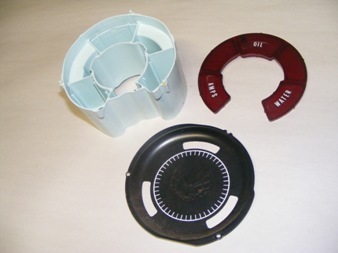 This is the fasten seat belt light assembly for use on 1970 - 1981 Firebird models. This is a factory used GM warning light gauge lens for 70-81 Firebirds. This sits in the main left across from the speedometer and lights up, Amps, Oil or Water warning laps.